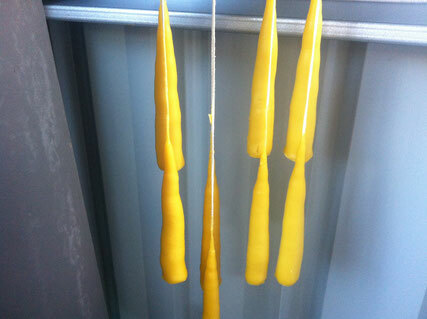 I have been making beeswax candles for well over 8 years, I ran a candle making business during this time, and beeswax candles were by far the most popular kind sold. They are straight-forward to make, you can use beeswax straight from the Bee-keeper, the superb glow of beeswax candles is divine, and it smell delicious! 2.) 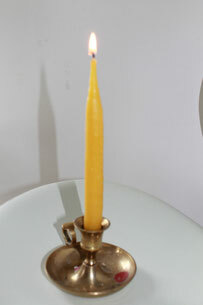 Melt Wax, when wax is melted to the point that it is clear then it is ready for Wick Dipping. 4.) To prepare wicks tie a weight to the bottom of each taper, i use wick tabs, but you can also use tap washers or little pebbles. 6.) Make sure you have a place to hang your tapers ready for example a rod like i use in the pic above. Please put newspaper on the ground unless you want wax all over the floor! 11.) After final dip dunk the tapers immediately into cold water, this helps to set the wax and shines the wax so it is golden. 13.) roll the tapers in wax / baking paper to polish and then hang overnight to set. 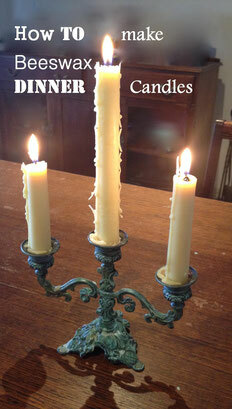 Enjoy your candles, the beautiful golden glow of Beeswax candles are hard to beat.